General purpose glove with a criss cross pattern for grip. Liner is machine knitted with a clear PVC criss-cross pattern. 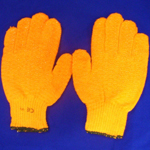 Size 10 is the most common size and the gloves come with an elasticated wrist. Our gloves are approved to EN420: 1994 and EN388: 1994.